I’ve been sharing what motivated me to start losing weight. Now I’d like to share a motivation that I got after I started. To date I have lost 9 inches. The number dropping on the scale is great but it’s the clothes getting looser that makes it all worth it and shows that my work is paying off. Last year I made a dress with my Titus 2 mentor. She was teaching us how to sew and had us pick out a pattern of anything, and I picked this dress. She very patiently helped me piece together every piece of this dress. She admittedly said she wasn’t a sewing pro, but compared to me she was a wealth of knowledge. 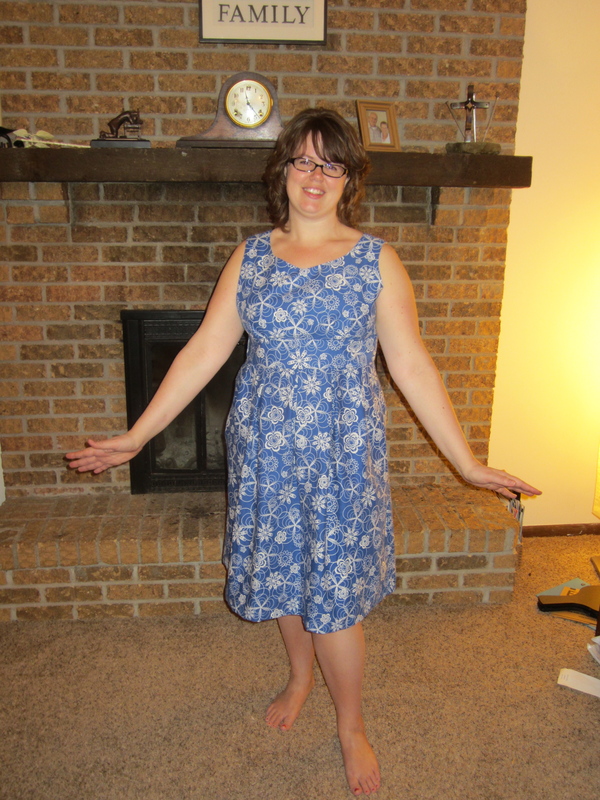 We worked on this dress for about a year, because we only met about once a month or bimonthly. When we were almost done, I had the thought, “What if it doesn’t fit?” We had worked really hard on it and it’s a cute, well made dress and what if it just has to sit in my closet? We finished it and I tried it on and it was pretty tight. I could barely zip it. I was bummed. Fast forward through a few months (of hard work). I saw it hanging in my closet. I thought I should try it on, I bet it fits a little better now. It fits! I can zip it quite easily! So, here’s to wearing my new spring dress! You know what I’ll be wearing Easter Sunday! Thank you for the dress, Carol! Weight last week: 168.5 lbs. Weight this week: 167.5 lbs. Total loss this year: 16.5 lbs. What motivates you to get healthier? 9 inches is fan-freaking-tastic! Congrats! And you look gorgeous in your dress, cutie! 9 inches is a great accomplishment and fitting into a something that was tight is even better! Keep it up! Thanks, Wendy! I’m working at it!